This one was cursing up a storm that would have made a pirate blush. He was not happy that I was standing next to his tree. Then I had the nerve to snap his photo. I’m surprised I survived the encounter. This entry was posted in Random and tagged 50 Year Project, Animals, Blog, Blogging, England, Foul Tempered Animals, Humor, Life, London, Photography, Pirates, Squirrels, Swearing, Wildlife. Bookmark the permalink. squirrels take no nonsense and stand their ground. not to be messed with, those squirrels! that’s a good shot of him staring down disapprovingly. LOL–he was not going to back down. I admired his fight and I gave him his space–after I took the photo. Hahaha yes I think you’re right, they are grumpy creatures! They are grumpy, but still adorable. Love their spirit! I was worried he was going to pounce on my head. LOL!!! He looks like he’s ready to pounce! Maybe he’s a ninja squirrel. I can just see him leaping through the air with a blood curdling “Hiiiiiiiiiiya!” and down goes TBM LOL!!!! I can totally see it. I bet he can do quite a bit of damage in a short amount of time. I was worried about my safety. Isn’t it crazy how freakin’ noisy those buggers can be when they are irritated about something. The ones in our neighborhood let us know how unhappy they are whenever we are outside with our dog. I had Miles with me this time. But even when it’s just me they let me have it. It’s so hard not to laugh since they make such a ruckus and they look so cute doing it. He is definitely giving you the stink eye. Yikes! You are lucky the squirrel was either not trained or was trained to hold back their attack urge. He’s so cute! 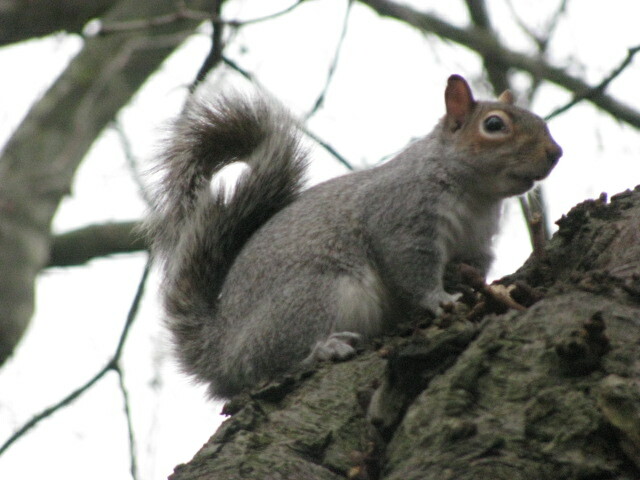 I’ve seen plenty of squirrels around but even though I’ve asked them nicely, none of them stopped for a chat. Very rude. Have you considered a bribe? That’s a good idea. Do they like dog treats? I usually have a couple in my pocket. Not sure about dog treats but a few times I’ve seen people in the park with walnuts, trying to convince the squirrels to come closer. The noise made by hitting two walnuts together (in their hard shells, of course) worked like a charm, and the squirrels came really close. It was always fun to watch them. They are adorable. I’ll have to try the walnut trick at one point. Hahaha, I’ve had a few squirrels act like this with me too! I’ve had earfuls from squirrels upset that I’m invading their space…inside my garden. Very funny. Made me think of the squirrels in Open Season who stand their ground very ably! He might be grumpy but he is still adorable! they are miraculous little mischiefmakers.